Barry and Dinah finished the Round Rockall Race just after lunch today and, on corrected handicap, is the overall winner. The fully crewed German entry Bank de Bremen finished yesterday at 15.30, but their heavier handicap put paid to their hopes. Rockall Island is a tiny rock, measuring just 25 x 31 meters and 21 meters high. It is located some 423 km north west of Tory Island. Ownership of the island is disputed among Ireland, Great Britain, Iceland and Denmark. It now belongs to Barry. Last Saturday’s National Yacht Club Regatta was sailed in breezy conditions, touching 25 knots which made for exhilarating racing. However a few of the SB20’s (formally known as the SB3) had some unfortunate mishaps, including the boat pictured above. The owner (no names!) has asked me to repair the boat and you can follow the step by step story here. 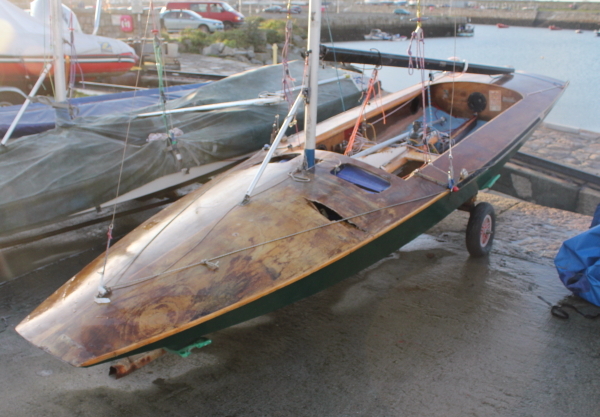 The plan is to have the boat seaworthy and race ready for next Saturday’s Royal Irish Regatta. This is Dogbolter, Fireball dinghy 14150, built in Australia by Peter Delange in 1989. I found the boat in this condition in the Coal Harbour in Dun Laoghaire in November 2011. I sailed in the boat many years ago and decided to acquire it for a complete rebuild. 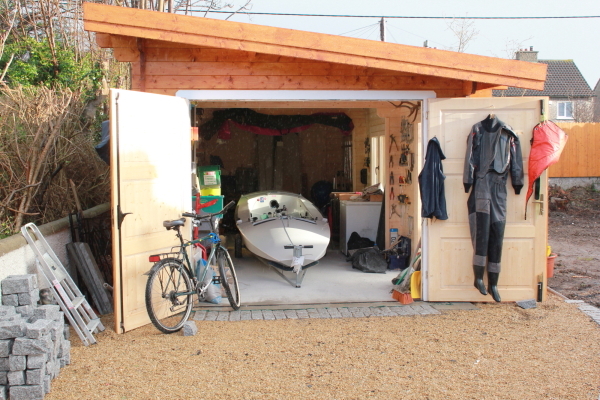 My project for the winter 2011 – 2012. Perhaps the boat will sail the 50th anniversary UK National Championships in Cornwall in mid-August 2012. I am fairly certain that Dogbolter is the only Fireball to have sailed in Australia and four other continents. 1992 Worlds (USA) – 14th – Vince Horey/? 2009 Various IRL events – Kenny / ? Great viewing from the America’s Cup World Series of AC45 catamarans racing in Plymouth, UK. 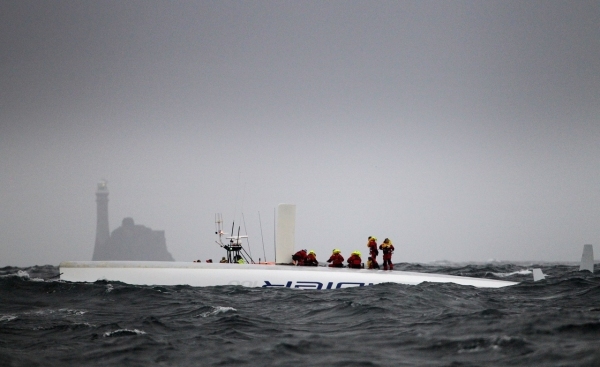 Dramatic action between the Rock and the Paentanius turning buoy where the maxi yacht Rambler 100 capsized during the 2011 Fastnet Race. Picture above taken by Phaedo’s media crew aboard Gerry Smith’s dive boat Wave Chieftain. Here is Baltimore Lifeboat Hilda Jarrett after taking 16 sailors aboard. Sky news has a good interview with Lifeboat Coxswain Kieron Cotter here. Kieron has nearly 40 years service with the RNLA, dating back to the Air India tragedy and Fastnet 1979. Irish Times interviews some of the crew ashore at Baltimore Sailing Club here. RNLI Press Release about the shout. Baltimore Lifeboat Station on Facebook. Diver and Lifeboat mechanic Gerry Smith at Aquaventures. Video on RORC website with aerial film of rescue here. Rambler rolled back upright in Barley Cove before being towed to Baltimore. What remained of the broken rig was cut away first and buoyed. Film taken of Rambler in Baltimore harbour from the Cape Clear ferry. Short video of Rambler approching the Fastnet in murky conditions. 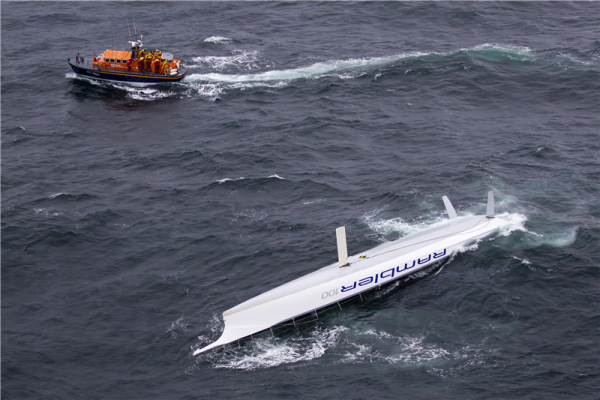 Maxi Trimaran Banque Populaire set a new course record with an elapsed time of 1 day, 8 hours, 48 minutes (32 hrs, 48 mins), and an average speed around the course of 18.5 knots. Volvo 70 Abu Dhabi set a new monohull record of 1 day, 18 hours, 39 minutes. More race info from RORC. 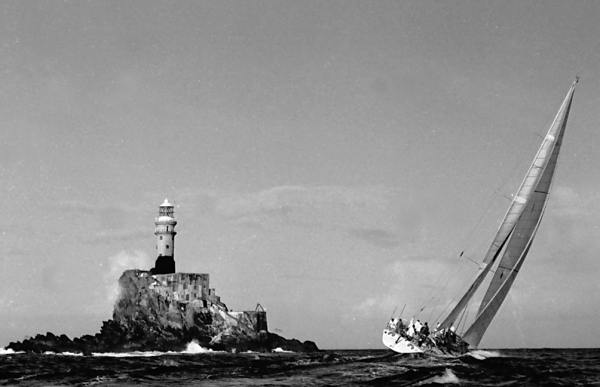 The Fastnet Race starts this morning with 350 boats entered. Starting at noon off Cowes, the 605 nautical mile race to the Fastnet and then to the finish at Plymouth is likely to be rather windy. I’ll be watching for Barry and Andy aboard Dinah, racing double handed in Class 3. 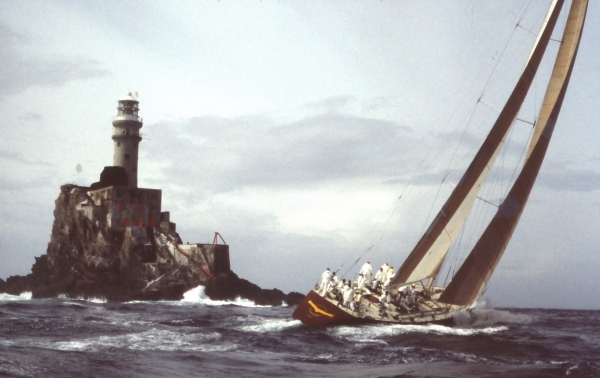 The only Fastnet Race I have done covered was in 1985, August 12 to be precise, via a fishing boat from Baltimore. That’s Condor above, front page of the Sunday Tribune that week. Here is Nirvana, which took line honours and shaved 12 hours off the previous record. The Guardian’s Bob Fisher reported on the race as a member of the American boat Jubilation, seen here with a light keeper in the upper right waving to the crew. The picture ran alongside his report in the paper. This video from Saturday’s opening race at Cowes Week shows the yacht Atalanta, sail number IRL 7533, in a bit of bother. Replay the video and pause at 23 seconds to see a crew member bail out overboard on the windward side. The 2002-built Corby 33 Atalanta has an IRL sail number but is most definitely not Irish owned. Previous owner Martin Breen of Galway bought the boat in 2007 and campaigned quite successfully as That’s Life. 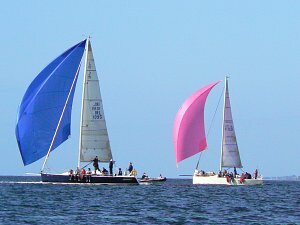 Here they are chasing down a J 109 in Galway Bay 10 October 2008 with the same shocking pink asymmetric spinnaker. 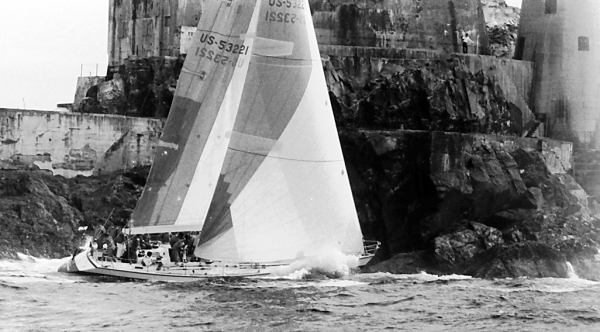 Breen sold the boat to a Cheshire sailor named Roly Wilson at the end of the 2010 season and acquired a Reflex 38 which he skippered to the overall win in this year’s Dun Laoghaire to Dingle race. The boat has a Facebook Page. The new owner of the Corby 33 campaigned the boat in the Hamble winter series and the 2011 Solent spring series, thus not a total beginner. Here are photos from the UK Daily Mail. Sailing in the Solent is great fun, but sailors must be, are legally required to be, aware of the shipping channel that bends around the Bramble Bank (shallow) and on up to Frawley and Southampton. Large vessels in the channel, such as the Hanne Knutsen (265 meters long) above, travel within a 1000 meter by 100 meter “Moving Prohibited Zone” with a Pilot Boat in the lead and often a braking tug attached to the stern. To maintain steerage, they are steaming at 9 to 12 knots. NO OTHER vessels are allowed within the prohibited zone. Associated British Ports are the harbour authority and are entitled to prosecute the skipper. Byelaws 10 & 11 and Associated British Ports Southampton Notice to Mariners No. 3 of 2011 giving details of a moving prohibited zone, which ranks as an obstruction for the purposes of RRS 19 and 20. Cowes Week Limited has been in contact with the hospital, the owner of the boat, and Associated British Ports (ABP) since the collision between a tanker and the racing yacht Atalanta earlier this afternoon. They are delighted to confirm that the hospital has discharged the injured crew member. An official investigation on the incident will be carried out in due course.